In recent years, science is turning its attention toward quantum studies – that is, how objects behave at the smallest unit – the molecular levels. This type of study is particularly useful to evaluate how various sealant products fail. After all, a crack seal begins its failure at the tiniest level when two tiny molecules pop apart. We are all familiar with asphalt as a flexible pavement that expands and contracts with temperature changes. It is this very flexibility that can cause cracking. It’s a tiny, single raindrop situation where cracks start with the force of rainfall or runoff providing the energy that initially weakens the asphalt bond. With repetition over time, the crack enlarges and admits still more moisture until the crack becomes a threat to pavement integrity and must be repaired. Asphalt is water insoluble, but it is not immune to the pressures of water movement – the formation of ice, for example, can pressure the asphalt bond and cause cracks. Water intrusion accounts for about 90 percent of pavement failures. Because smaller cracks are easier and cheaper to repair, it’s good to catch them early. In looking at why sealants succeed or fail, there are a number of factors to consider… crack shape, size, surface roughness, moisture content and the presence of loose particles, along with repair technique – all contribute to a successful crack seal project. To find the best sealant for a job, it’s important to know that the two most important properties of a sealant are adsorption and interlock. Adsorption is where the sealant molecules accumulate on the surface of the asphalt mix. It is not absorption where a substance changes into a liquid or solid to form a solution. In adsorption, particles are bound by physical or chemical attraction. ASTM, the American Society of Testing and Materials, has produced widely used test specifications for polymer-modified and asphalt rubber sealant products. Cold-applied products include liquid asphalt emulsions and polymer-modified liquid asphalt. Cold applications are mere crack fillers that simply do not provide the bonding and ongoing flexibility of hot applications. Chemically-cured products are relatively new to the market in the form of a self-leveling silicone. 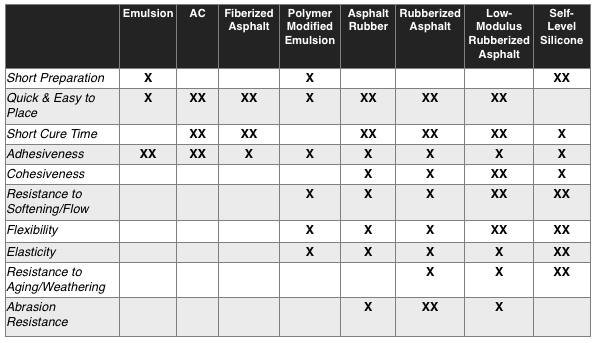 The hot-applied options include such things as fiberized asphalt, asphalt rubber or rubberized asphalt. Fibers included in the mix impart flexibility and are impervious to temperature changes, so generally, fiber content is good for crack sealant. But the most effective sealants on the market today continue to be the rubberized formulas. The percentage of vulcanized rubber in the mix enhances flexibility, and the presence of polymers increases resilience of the repair. Polymers are basically defined by their elongated molecular structure. There are natural polymers such as cellulose, shellac, amber and rubber. There are also synthetic polymers such as nylon, neoprene, PVC and silicone. Basically, polymers have to do with bonding, stretching and protecting – as cellulose is the primary ingredient in wood that holds it together, for example. In asphalt sealants then, polymer modification adds polymers to the asphalt to help hold the molecules together while providing the flexibility that ensures a long-lasting repair. Crack Sealing — The placement of specialized treatment materials above or into working cracks using unique configurations to prevent the intrusion of water and incompressibles into the crack. Generally, a working crack is one that shows horizontal movement of more than 3 millimeters per year. • Rubber- and fiber-modified asphalt fillers placed flush or overbanded in the same cracks serve for six to eight years. • Rubberized asphalt sealants placed flush or overbanded in routed, working cracks last from five to nine years, whereas placed overbanded in nonrouted working cracks, they generally provide two-and-one-half to five years of service. • Self-leveling silicone placed recessed in routed/sawn, working cracks performs satisfactorily for at least four to six years. • Fiberized asphalt placed overbanded in unrouted, working cracks provides a maximum of two years of service. In the final analysis, contractors must consider their own actual experience and results from any treatment choice. Your particular climate, your application techniques, your equipment, pavement condition, your volume and your costs must all be factored into the equation of what is the best choice. Again, as we said in the first sentence, according to SHRP analysis, the most cost-effective, long-term results come from modified, rubberized asphalts, placed overbanded in routed cracks.